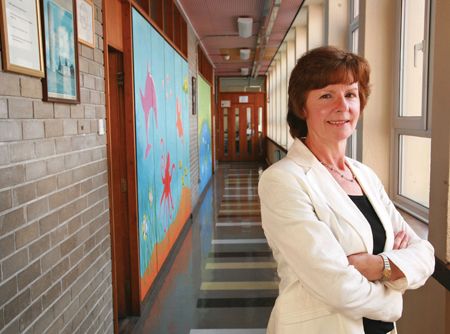 The tranisation from Primary to Secondary school is a good example of the enormous social change facing children at this stage, says Eillen Kelly, a psychologist with Galway Diocesan Centre. Moving from primary to secondary school can signal major change for many children. Twelve year olds who were until recently seniors in primary school become juniors overnight again. They leave behind familiar faces and places and enter a new world, usually a bigger school, with new teachers, students, subjects, an increased workload and a longer day. In addition, the onset of puberty tends to coincide with the transition to secondary school bringing with it more challenges for children and indeed parents. Eileen Kelly, a psychologist and the director of the Diocesan Pastoral Centre in Newtownsmith which runs parenting programmes, says these are physical, physiological and social. Add to this the physiological - acne, hormones, moods - and you are into a minefield, she says. She says the transition from primary to secondary school is a good example of the “enormous social change” which occurs around this time. “Physically moving away from the smaller and more familiar local school to bigger secondary school …. more places to get lost in! It can be a challenge to find/locate the right classroom/lockers, etc, to become familiar with the geography of the new surroundings. The children’s social circle is widening, also. Parents may no longer know their friends as they meet new people. How can parents help their children? Eileen says tell them what to expect but do it in a way which conveys your belief in them to master this transition both academically and socially. “Don`t pass on your own fears. If you have concerns talk to someone who knows, not another parent. Encourage your children to be aware, to take notice of their surroundings by asking them questions about their rooms, lockers, the general geography of the school. “Talk about some of your own experiences and how you coped. Encourage them to make new friends and make an effort to get to know them, too. Listen, stay in touch, hear the stories. You don’t have to act on every idea but it is important to give them a hearing and to be familiar with what is going on for them. Become involved in school activities, as far as possible, by attending meetings and generally displaying an interest in the life and workings of the school, recommends the psychologist. Eileen suggests that while they are beginning to move into the adult world it is a good idea to keep them engaged with the family by being involved in family meals, outings and chores, however minimal. During the difficult moments when you are questioning your parenting abilities and rapidly losing heart and patience, remind yourself that are involved in a major life changing undertaking - preparing your child for the adult world. “It is our privilege and responsibility to pass on our values. In the mobile world in which we now live the extended family support of past generations and the close-knit community support of the past is no longer available, therefore our job becomes more challenging. Also with the availability of information and mis-information through access to internet and television our values and belief systems are being challenged earlier and earlier in our parenting life.